Lists of the Top 50 CHR and Rhythmic Songs by year from 2018 to 2006. 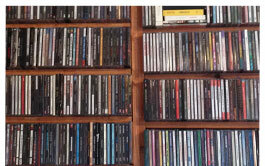 We have a massive CD wall with 100,000+ songs not listed online (including currents and recurrents)! To view a music list of songs in our format left click on its name below. To download your copy of any list to your local hard drive, right click and pick 'Save Link As.' If you don't want the entire library, pick your songs by marking 'X' in the far left column. You'll only pay for those you do want.